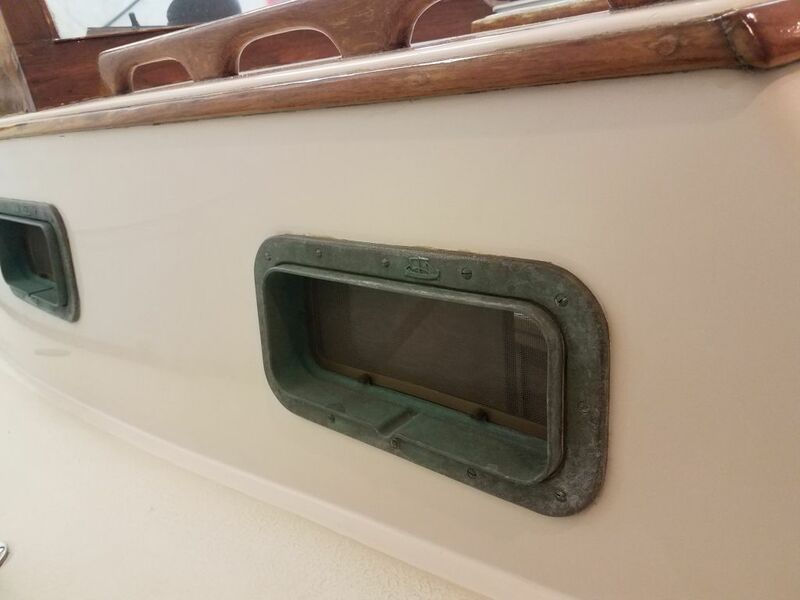 There were several large plastic deck hatches in the cockpit, which appeared original and were in fair condition. 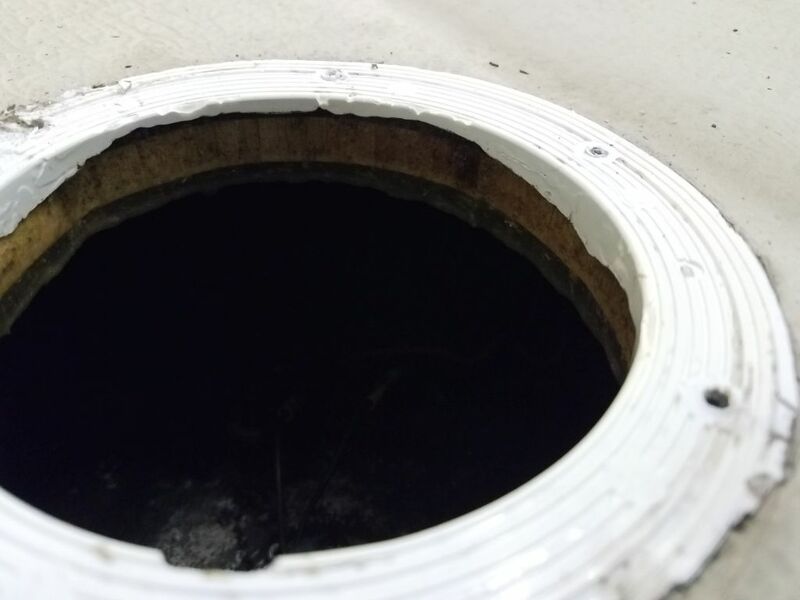 At least one of the flanges had a crack, and the surfaces were dirty and shop-worn. 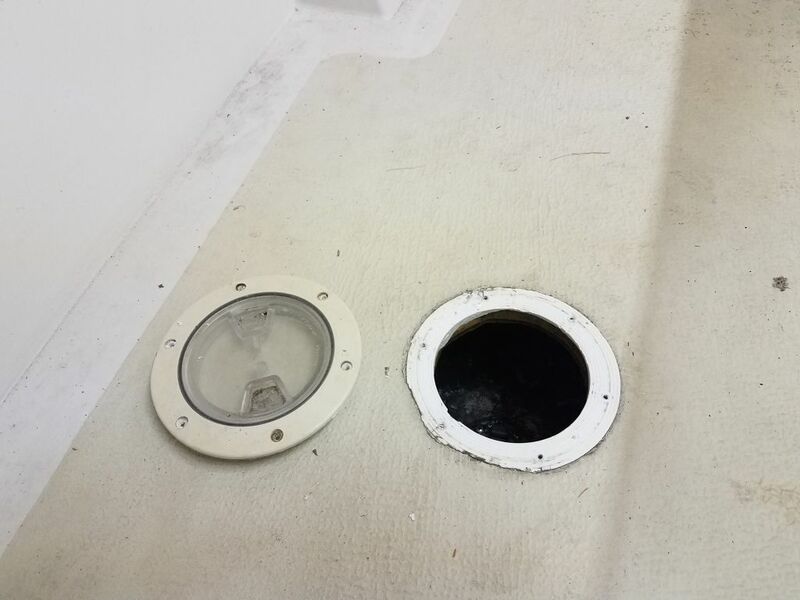 I wanted to remove the hatches before painting the nonskid, and approached the first one cautiously (well, I approached them all cautiously, but particularly the first), as I was concerned that it might be hard to remove the hatch without damaging it. 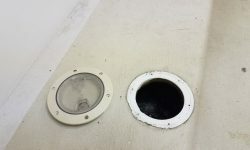 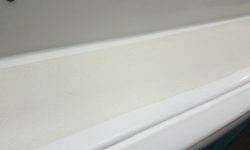 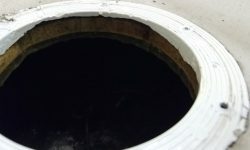 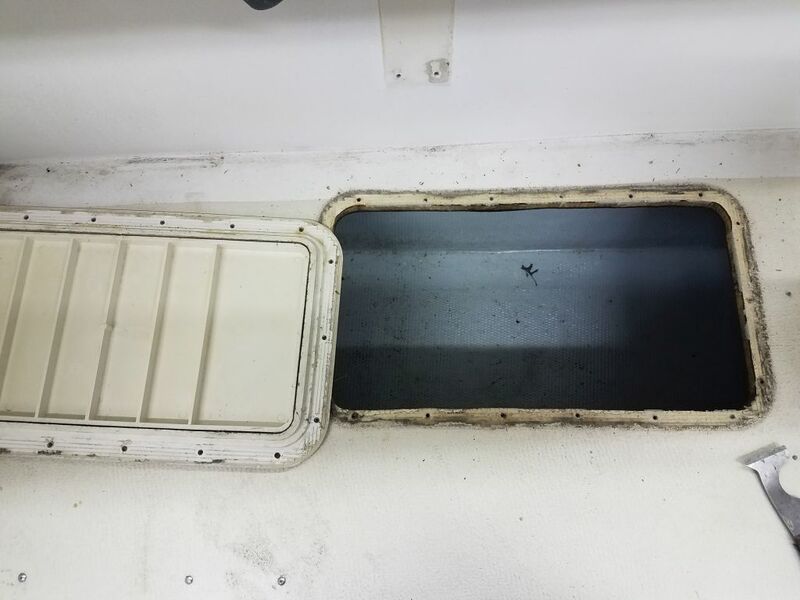 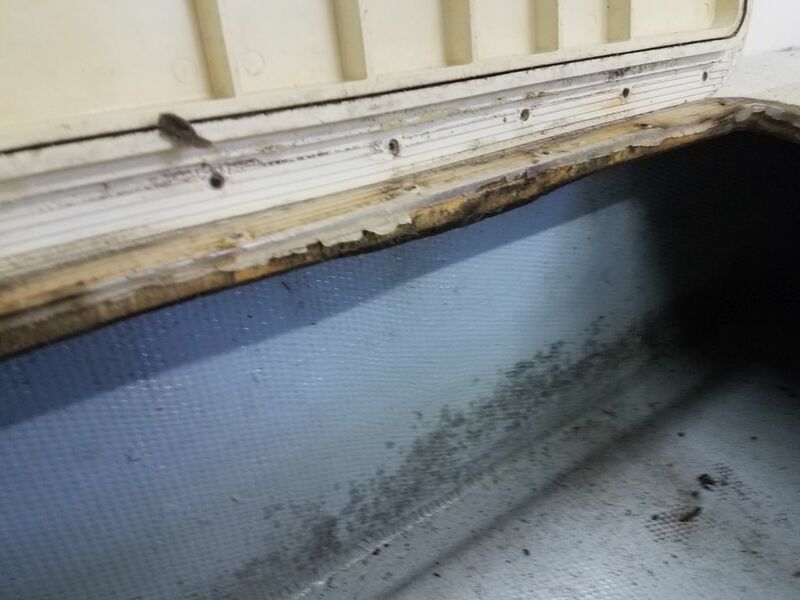 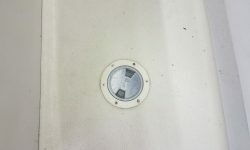 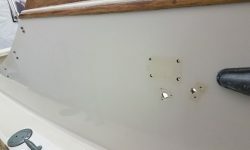 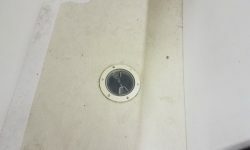 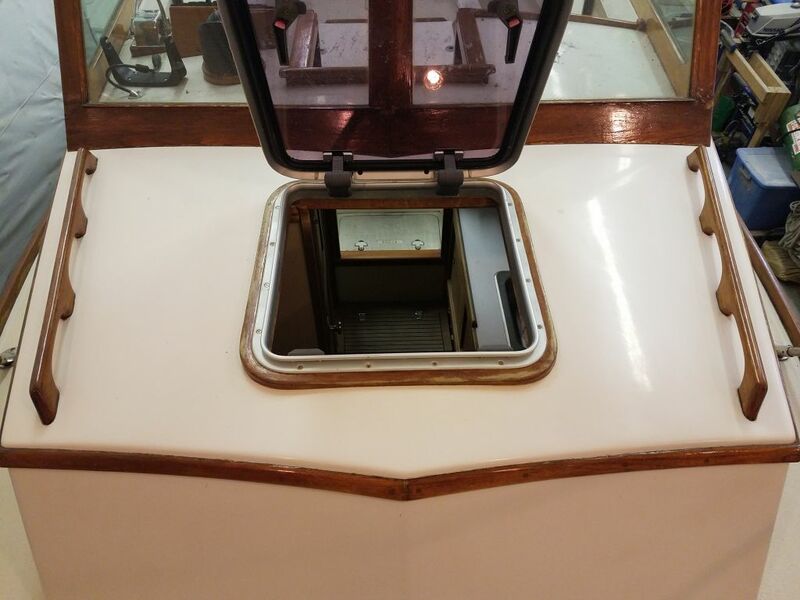 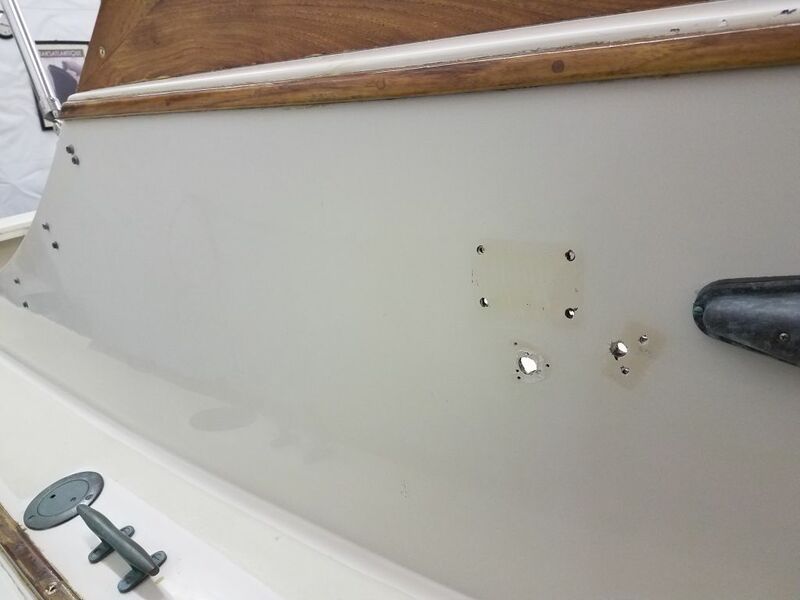 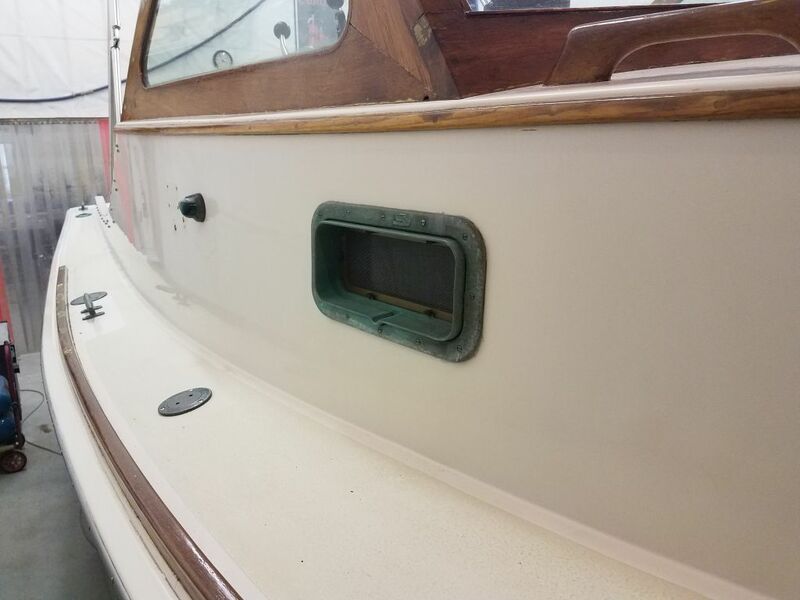 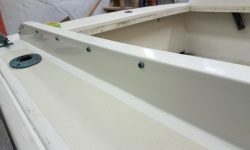 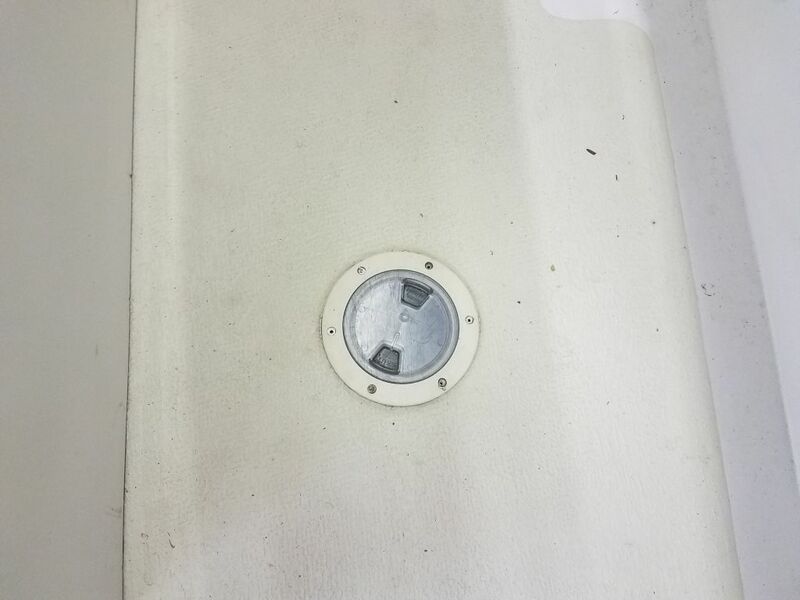 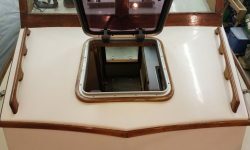 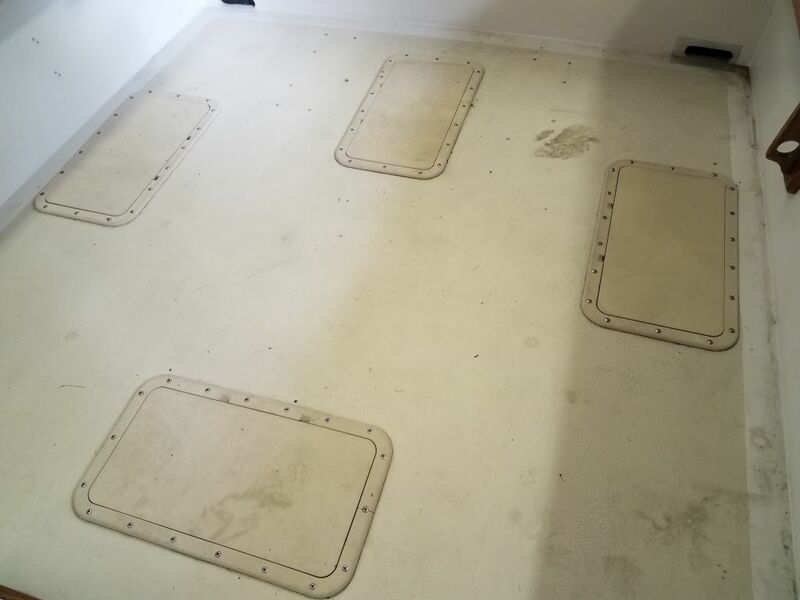 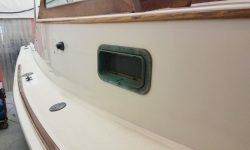 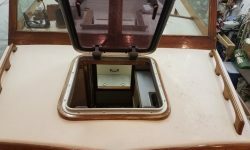 Plastic hatches can become brittle with time and UV exposure, and depending on the installation details this means removal often irreparably damages the hatch. 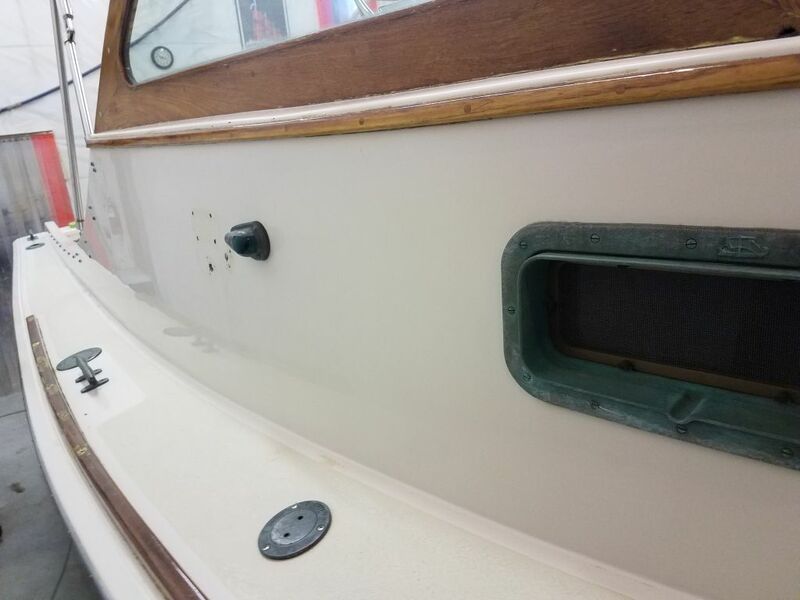 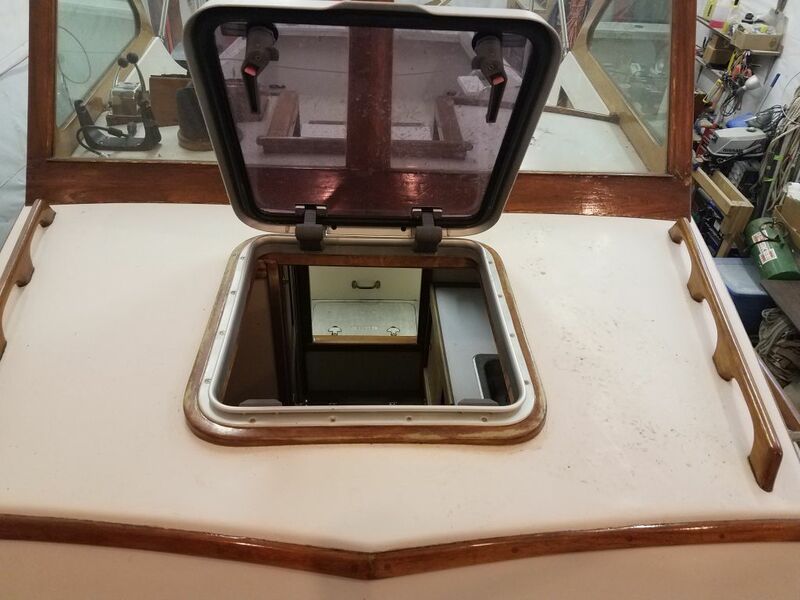 Before attempting to remove the hatches, I researched replacement possibilities, which the owner wanted anyway, but I didn’t want to end up with damaged hatches and no ready replacements. 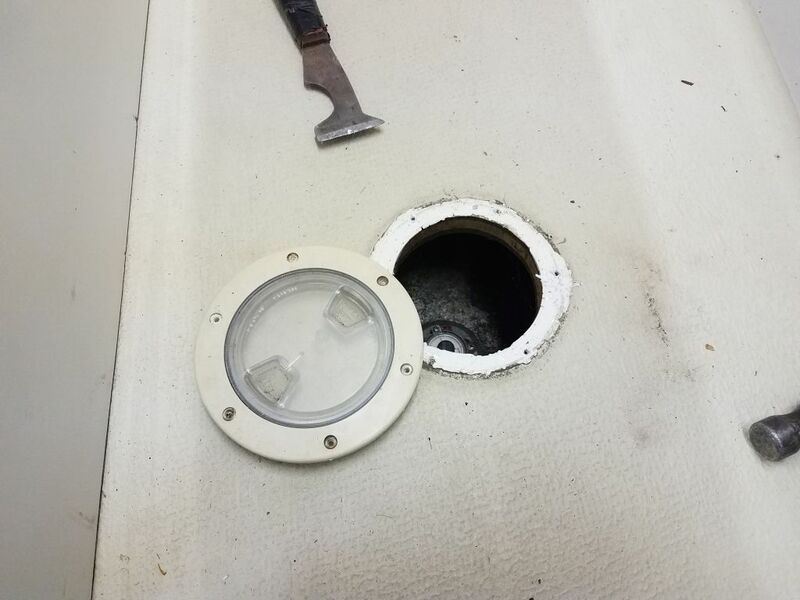 I found new hatches made by the same company and to the same dimensions, though with a different lid design (hinged and handled, rather than pry-out), so we were all set there. 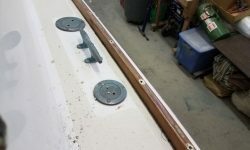 I ordered the replacements and got down to the removal. 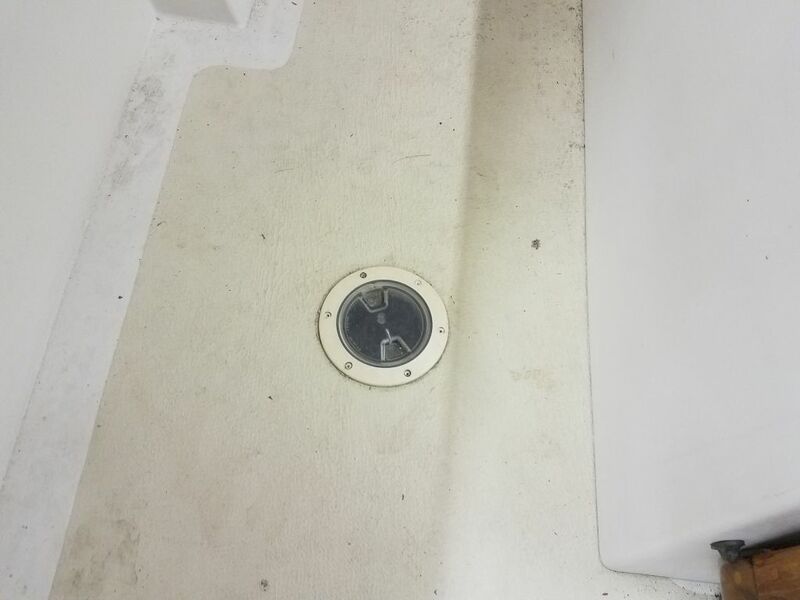 Fortunately, in this case the hatch was easy to remove. 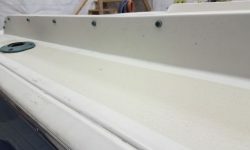 It was installed in a bed of silicone sealant, but fortunately one that didn’t have much in the way of adhesion to the hatch flange. 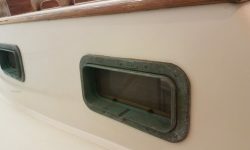 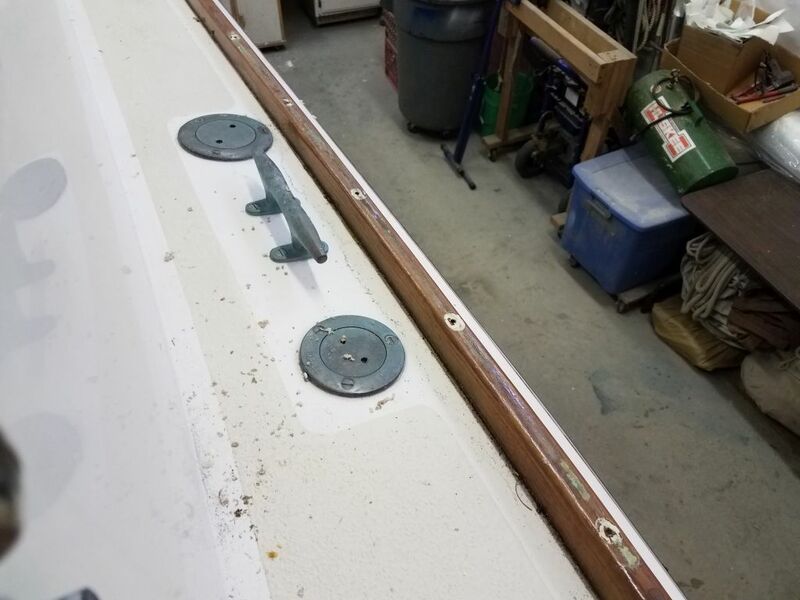 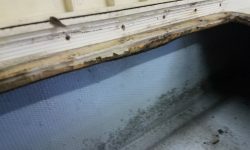 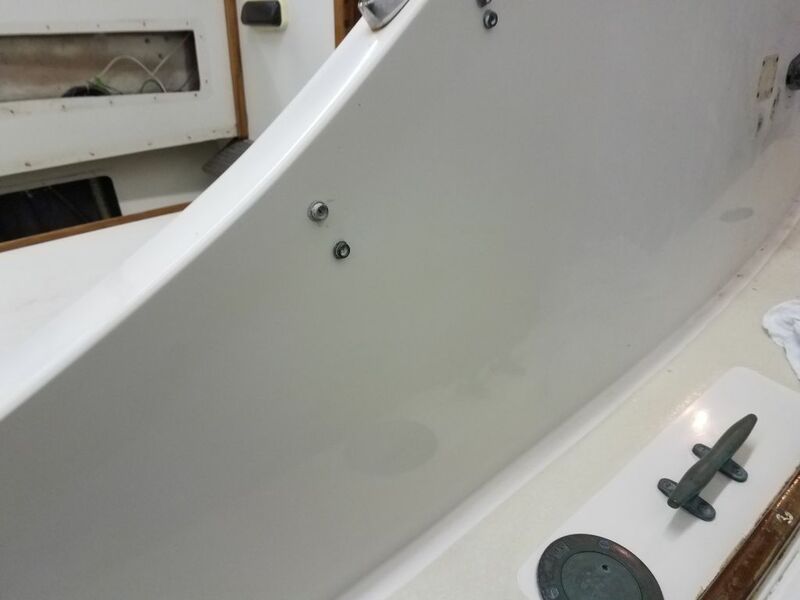 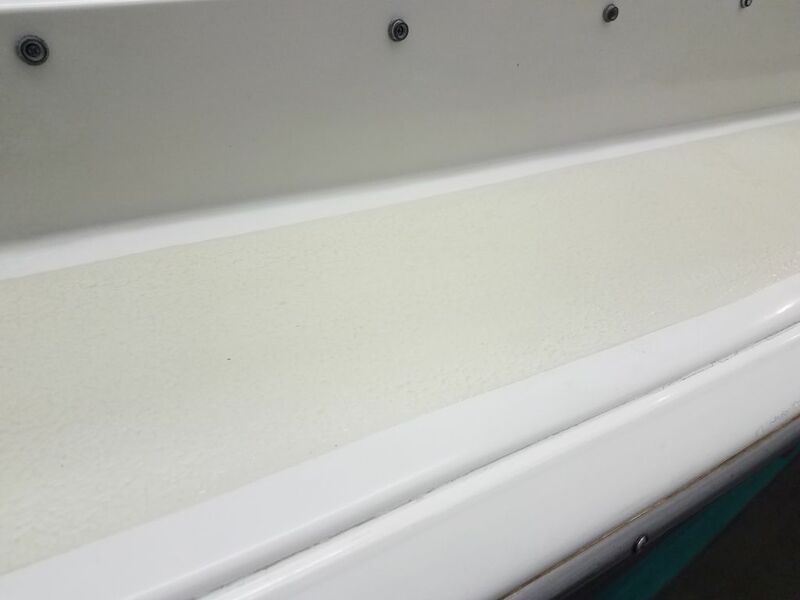 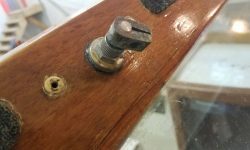 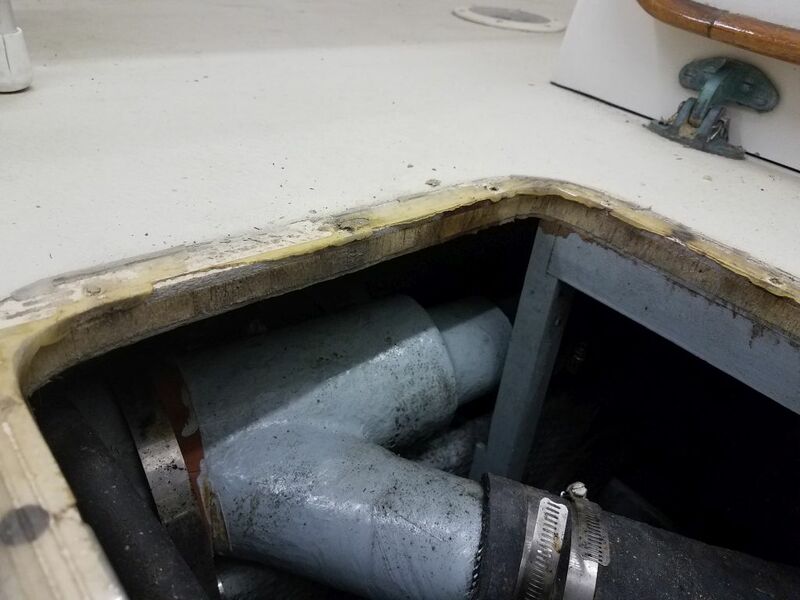 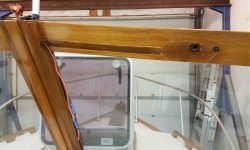 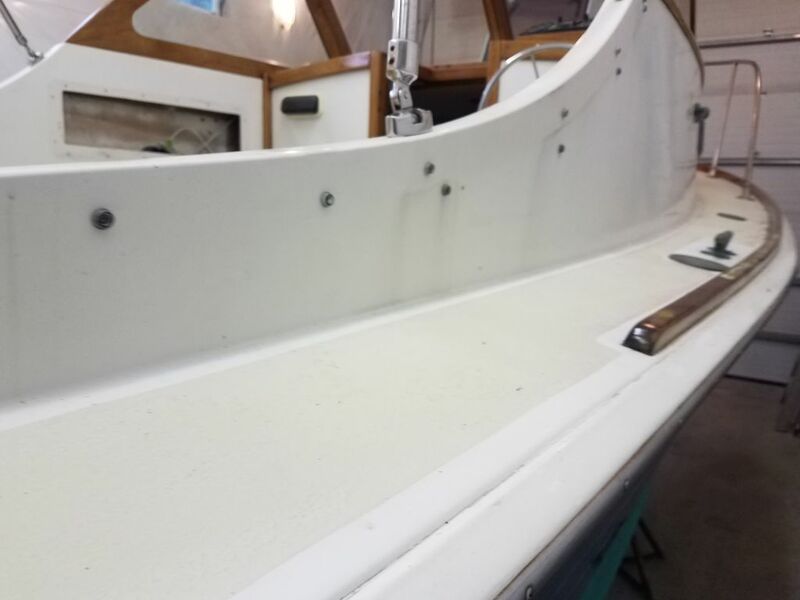 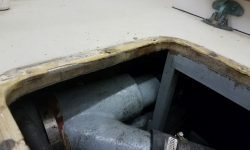 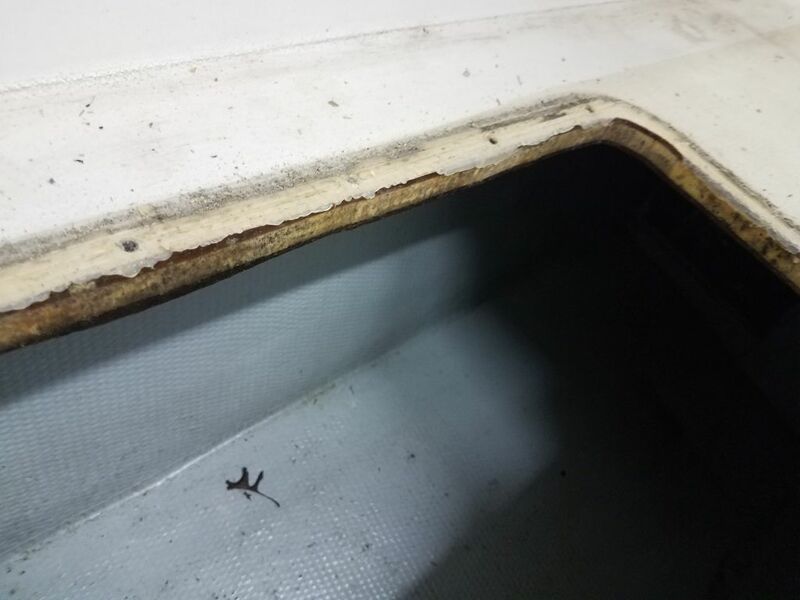 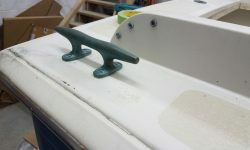 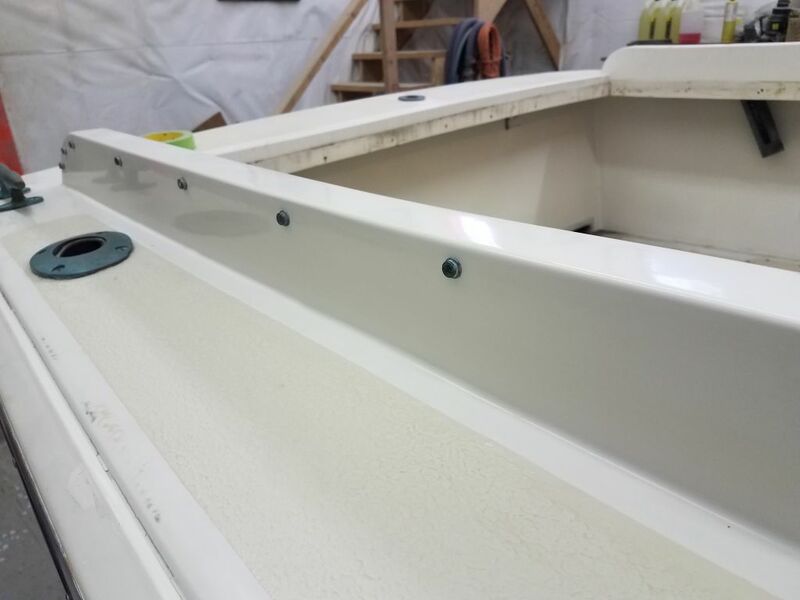 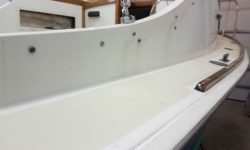 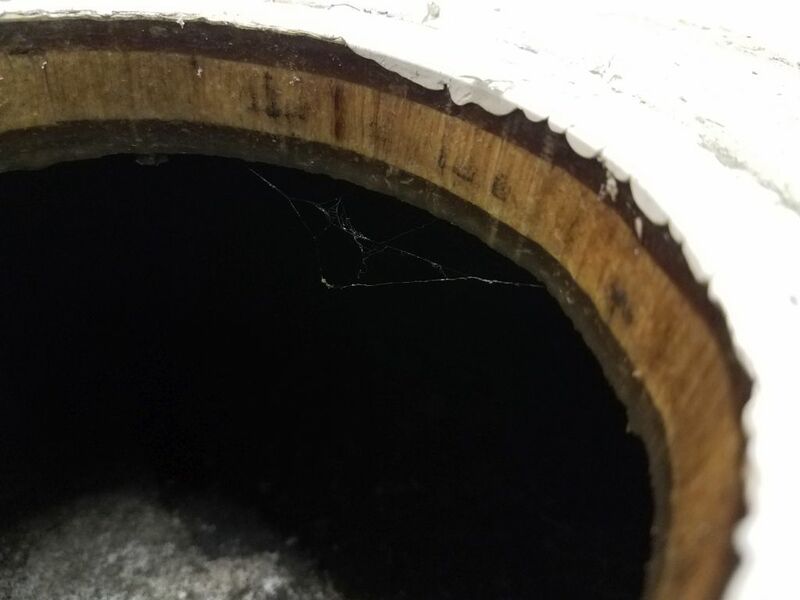 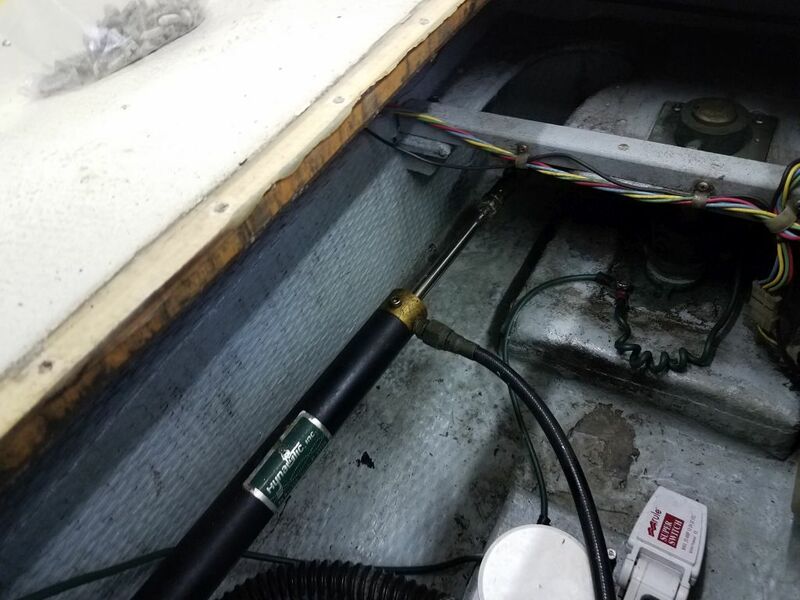 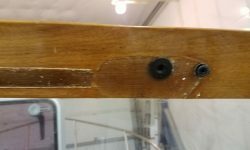 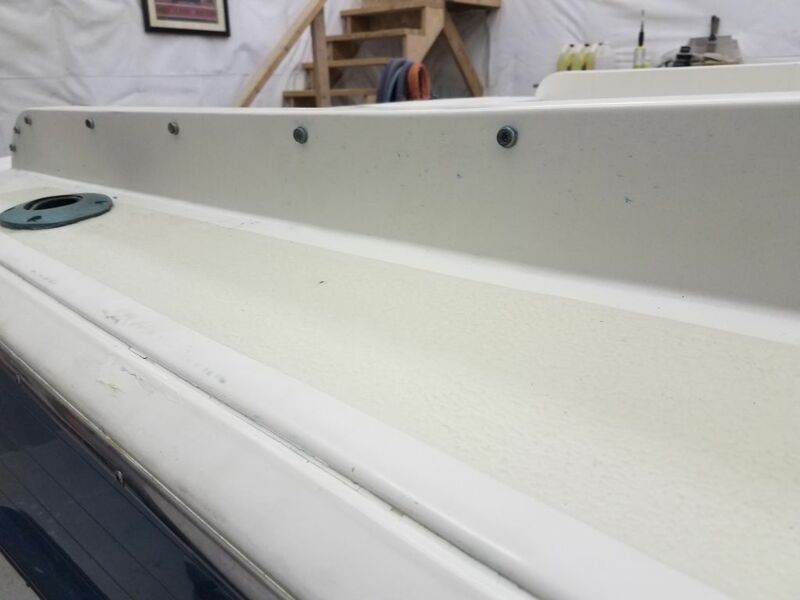 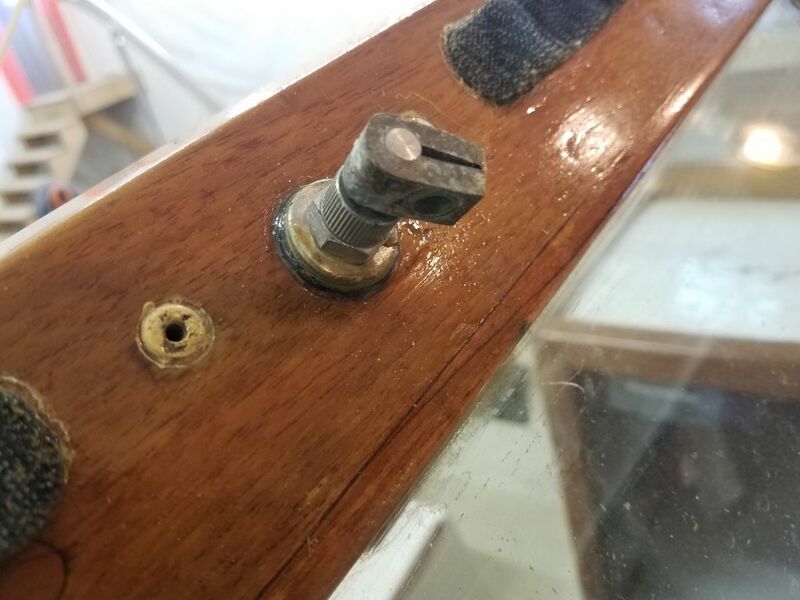 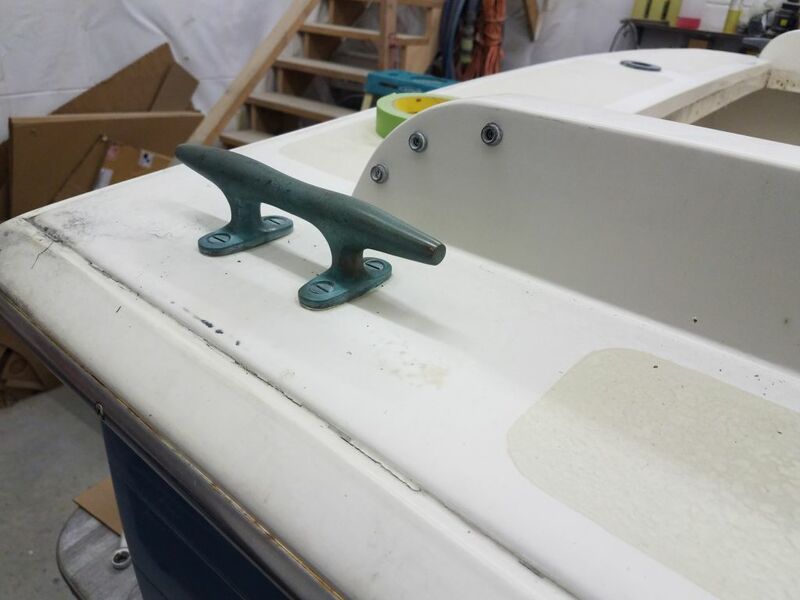 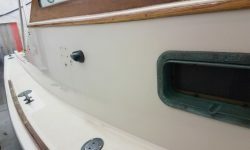 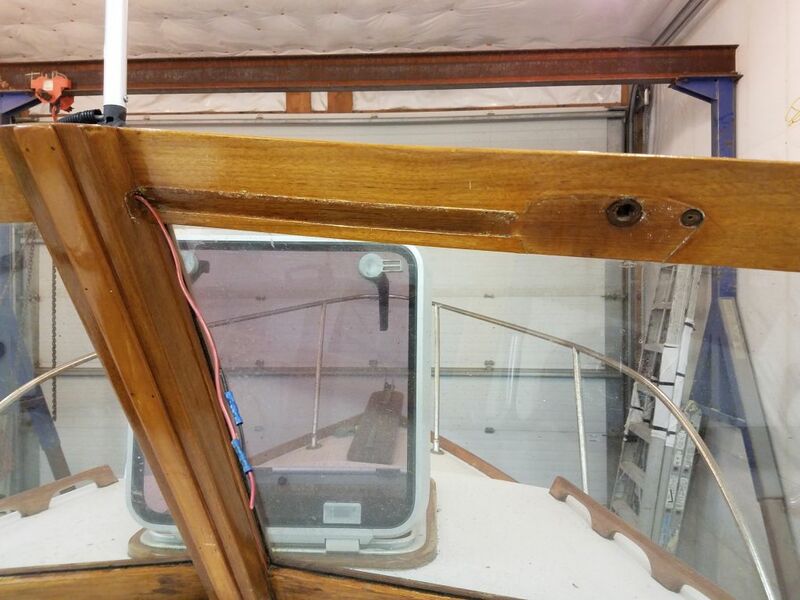 The exposed core in the opening, under close inspection, had been coated with resin during the boat’s construction, and this had protected it successfully from any real damage, though there was minor water discoloration here and there. 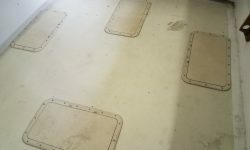 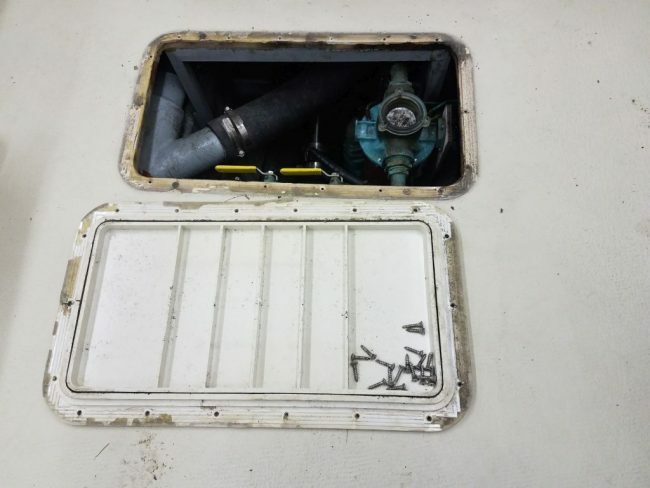 Buoyed by the success, I quickly removed the remaining three rectangular hatches, along with a pair of round inspection plates over the fuel tank gauges. 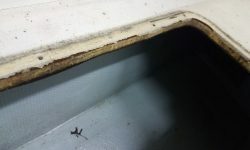 All openings were in similar condition. 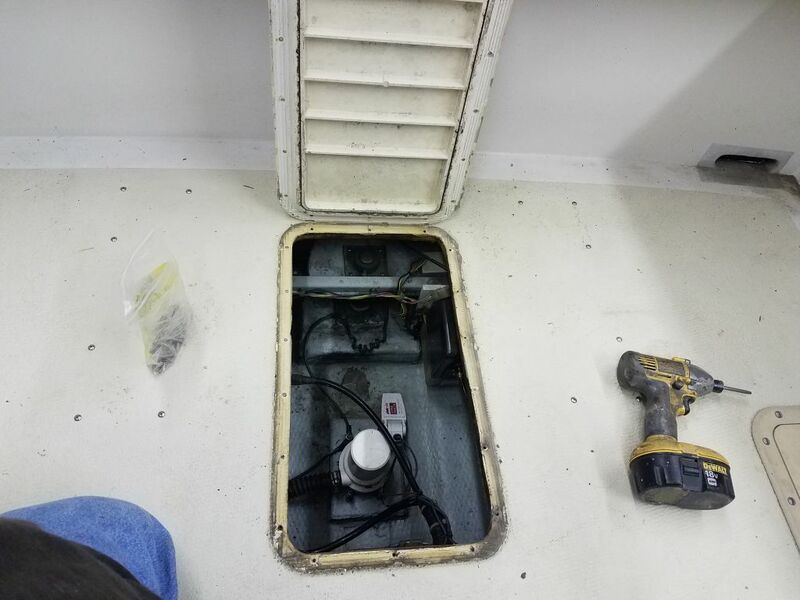 For now, I left the hatches loosely in place while I worked around the boat. 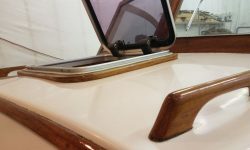 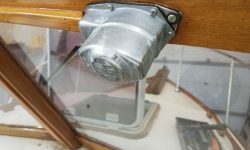 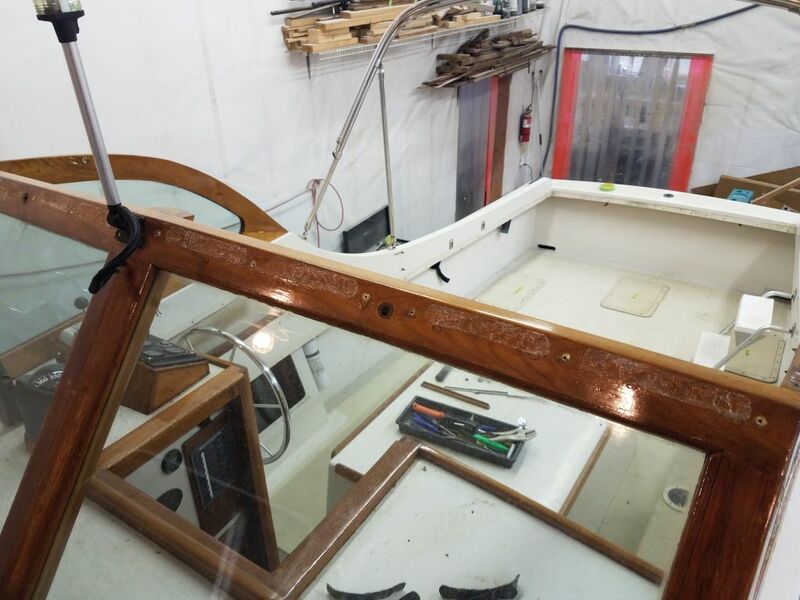 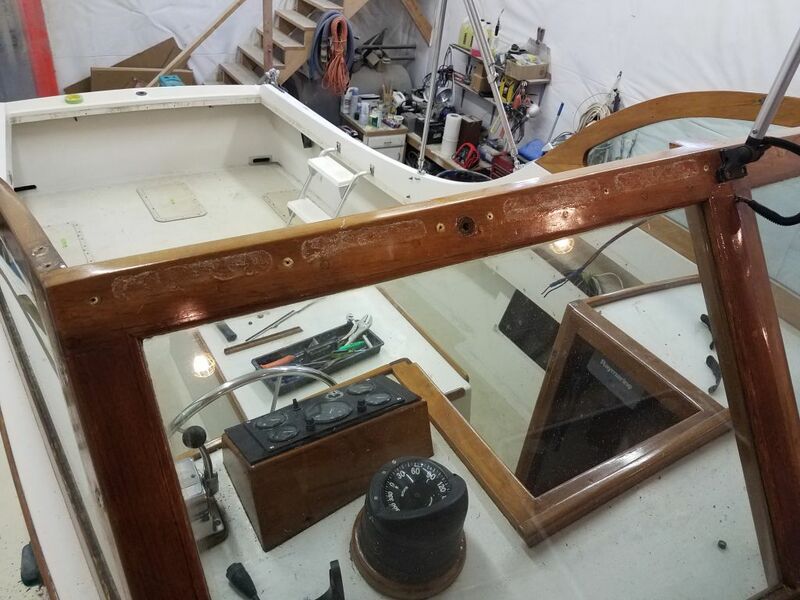 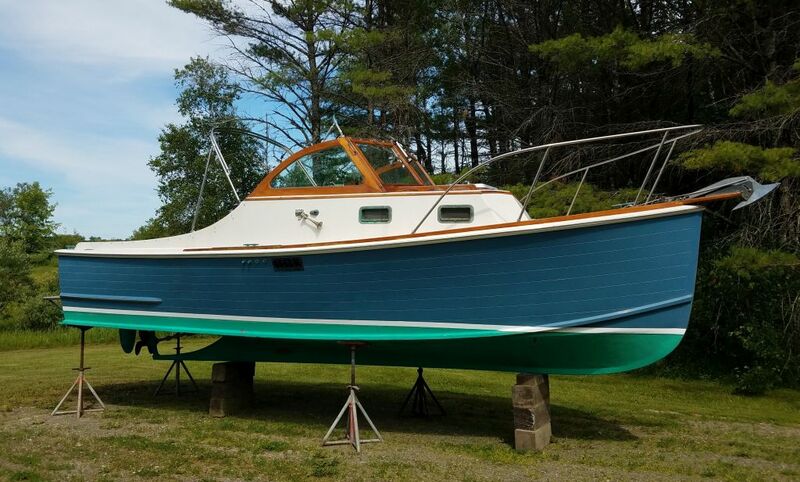 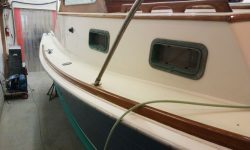 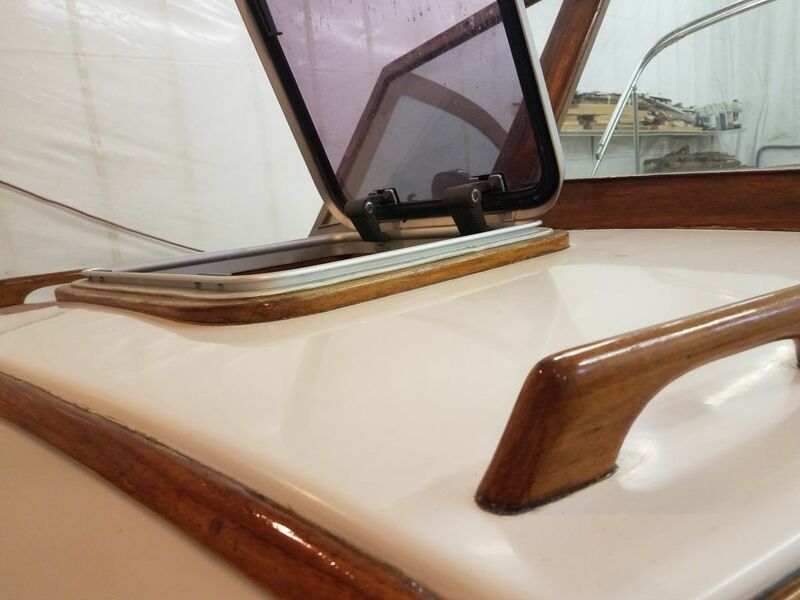 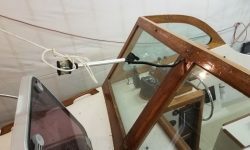 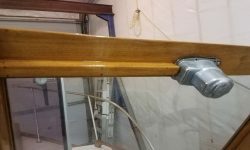 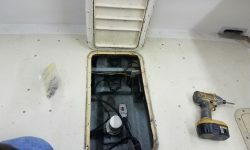 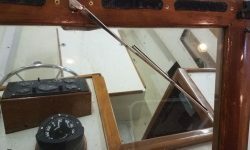 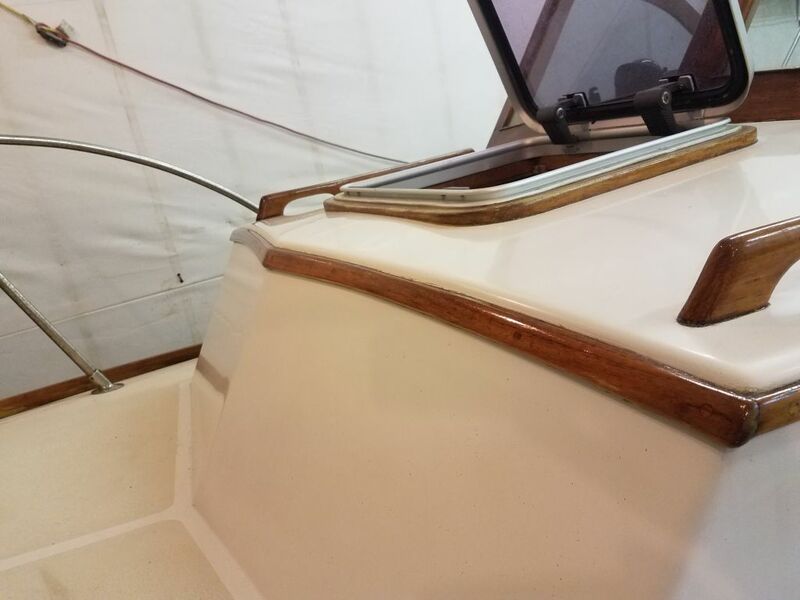 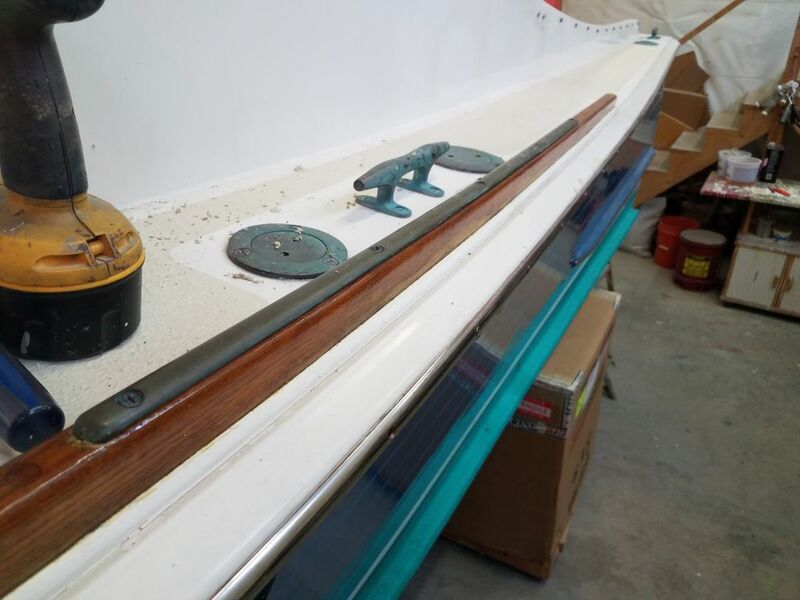 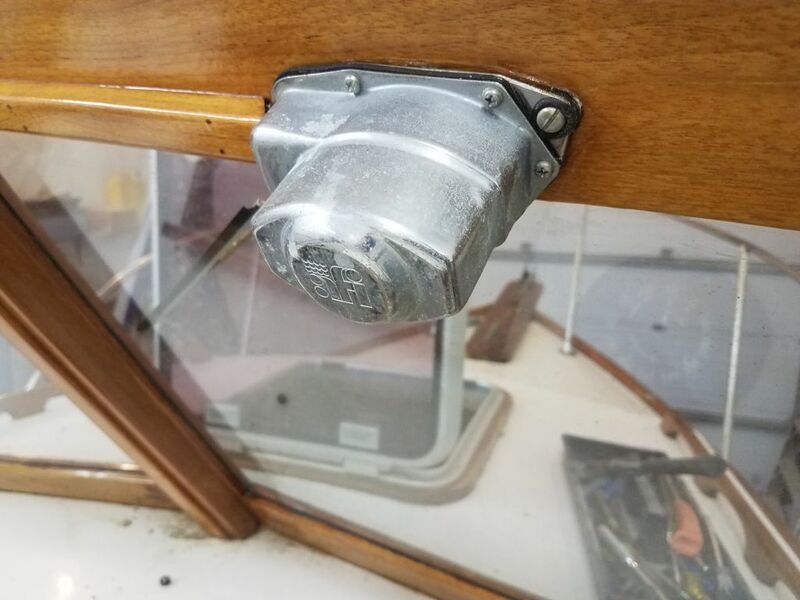 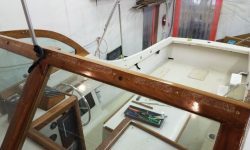 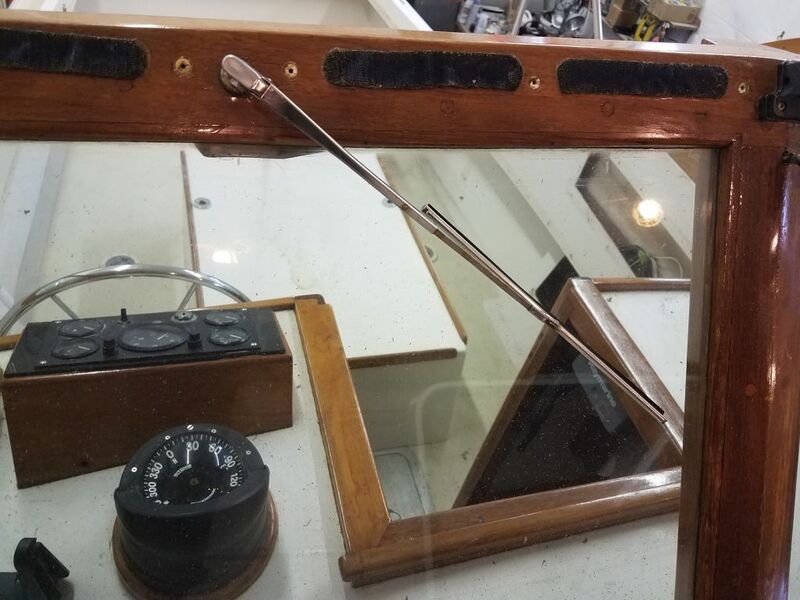 The owner suggested that the windshield wiper located on the starboard side was less than adequate for the task, with a weak motor and unhelpfully lightweight arm and blade, so I looked into replacements. 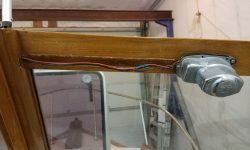 Having located a motor, arm, and blade combination that seemed appropriate, I went ahead and disassembled the existing wiper, carefully removing the parts and a wooden trim piece over the wiring. 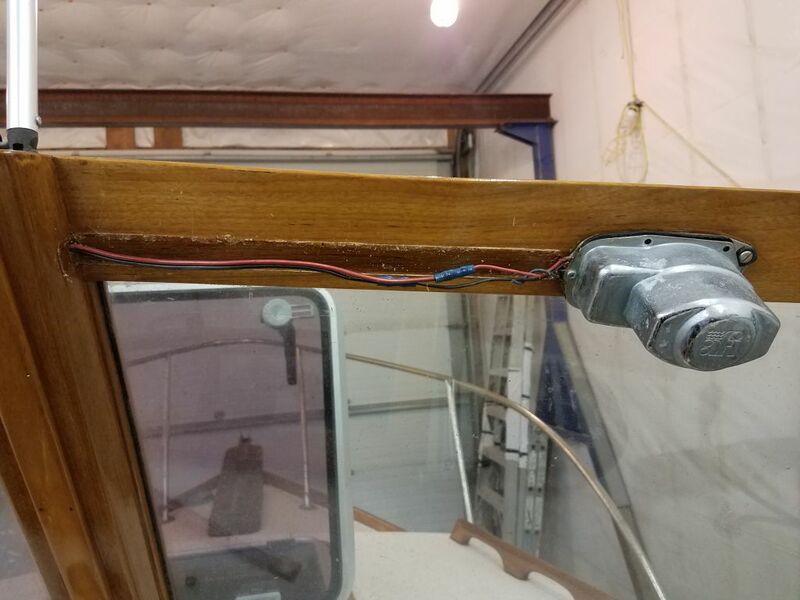 This would have the added benefit of making the varnish work that much easier and better. 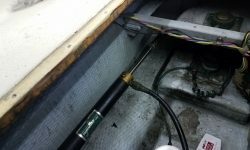 I’d install the replacement unit later, once the maintenance was complete. 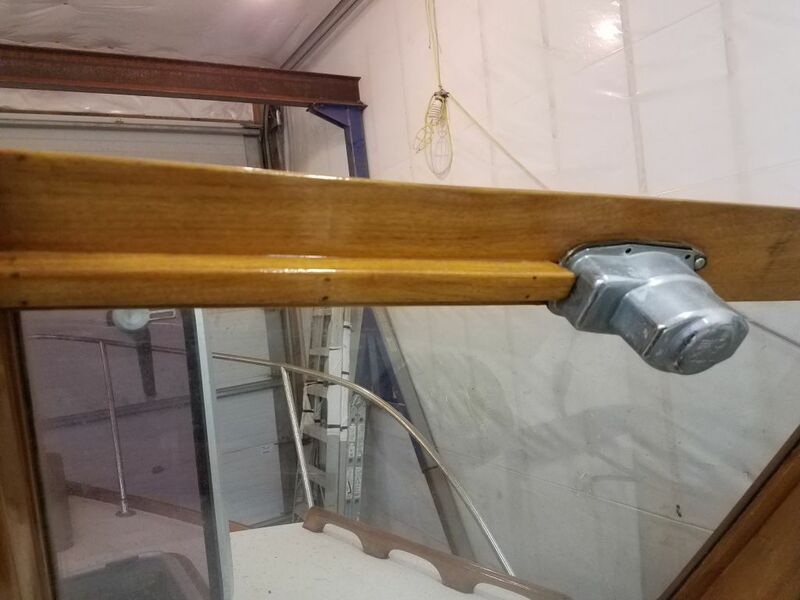 I’d already removed a simple manual wiper from the port side. 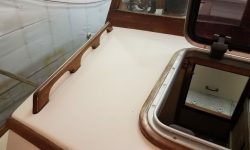 A series of Velcro strips at the top edge of the windscreen, used to help secure the canvas top, were wrinkled with age, and partially losing their adhesion, so I decided to remove them, which would also make the varnish work easier. 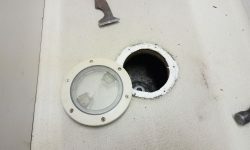 I also removed and secured out of the way the little light fixture in the center of the windscreen. 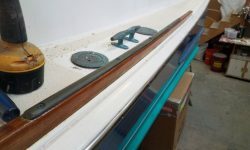 Some final trim in the way was a pair of bronze chafe guards on the toerails amidships, in way of the breast cleats. 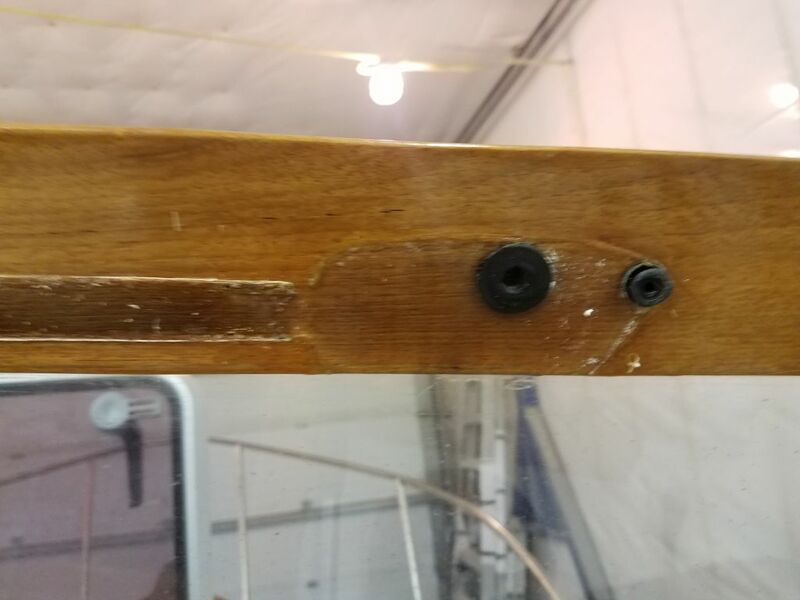 I removed these so I could strip the toerails and revarnish. 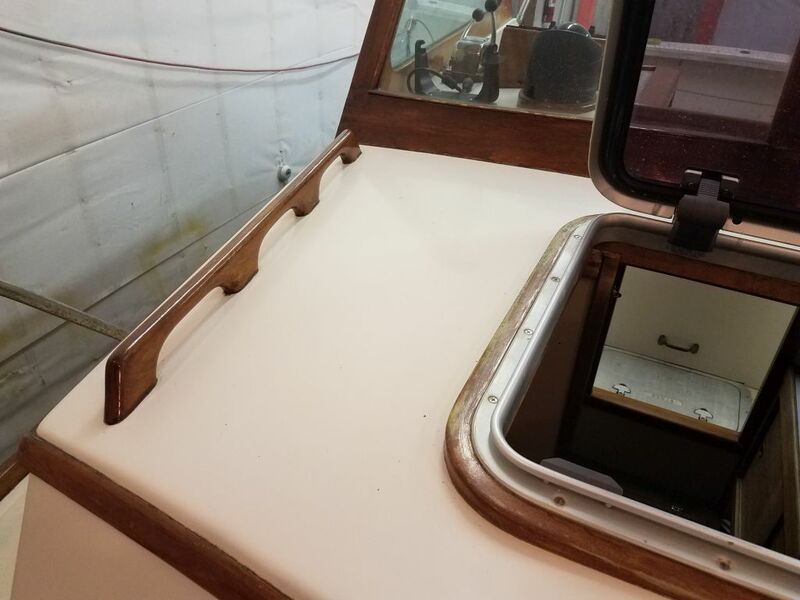 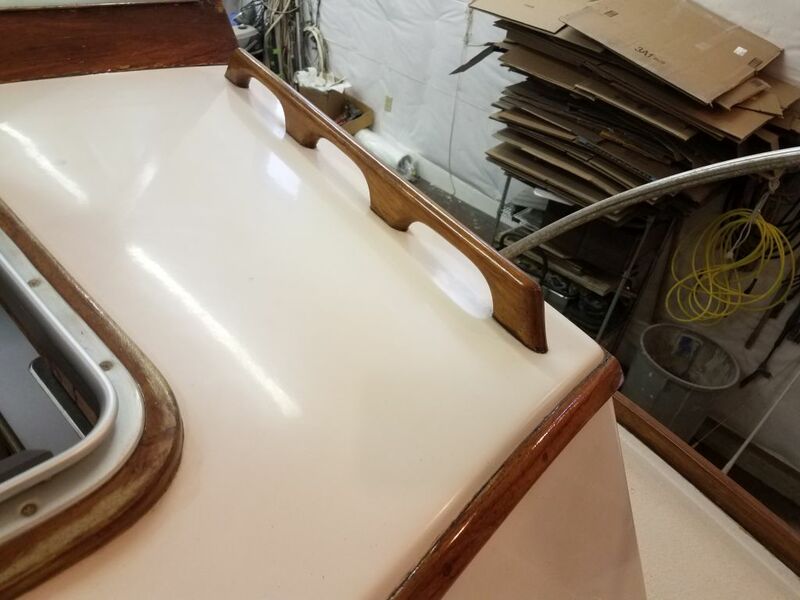 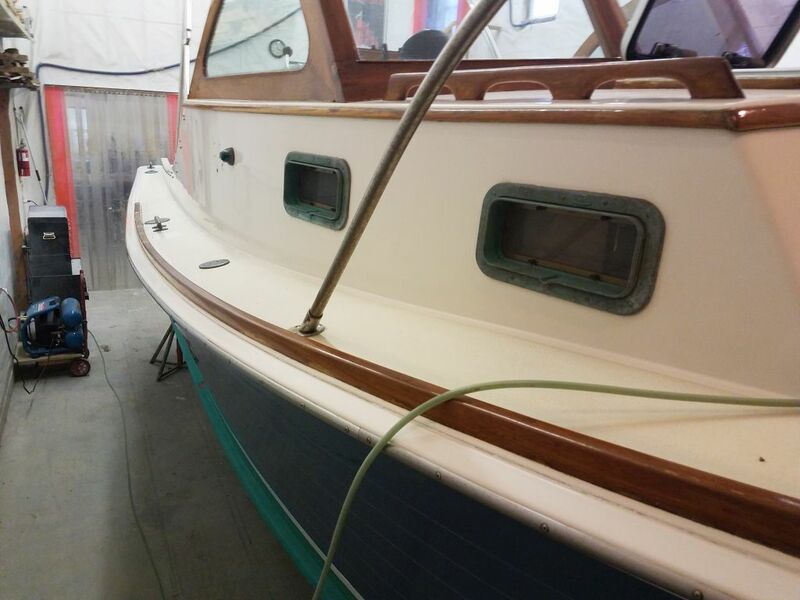 With the dismantling and related work complete, I spent the rest of the afternoon working on another item on the work list: gelcoat polishing, starting with the starboard sidedeck and cabin trunk. 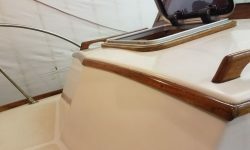 The original gelcoat was in generally good condition and had been maintained throughout its life, but was dirty and oxidized. 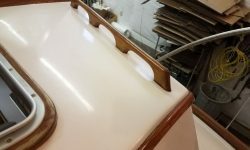 I chose to clean this now since it was easier to do the areas adjacent to the nonskid now, before painting, because all the surfaces required cleaning before I could mask for paint and varnish anyway, and this way I didn’t have to tiptoe around freshly-refinished surfaces. 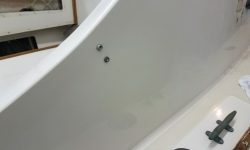 It was also a good way to fill random bits of time like I had available now. 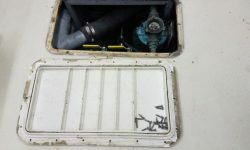 These photos give a sense of the initial condition of things before I started. 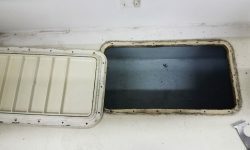 Over an hour or so, I cleaned the starboard side of the cabin trunk and sidedeck, as well as the coachroof and forward side of the cabin trunk. 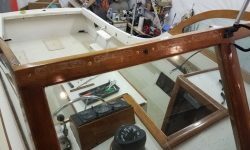 This brought me to a good stopping point for now. 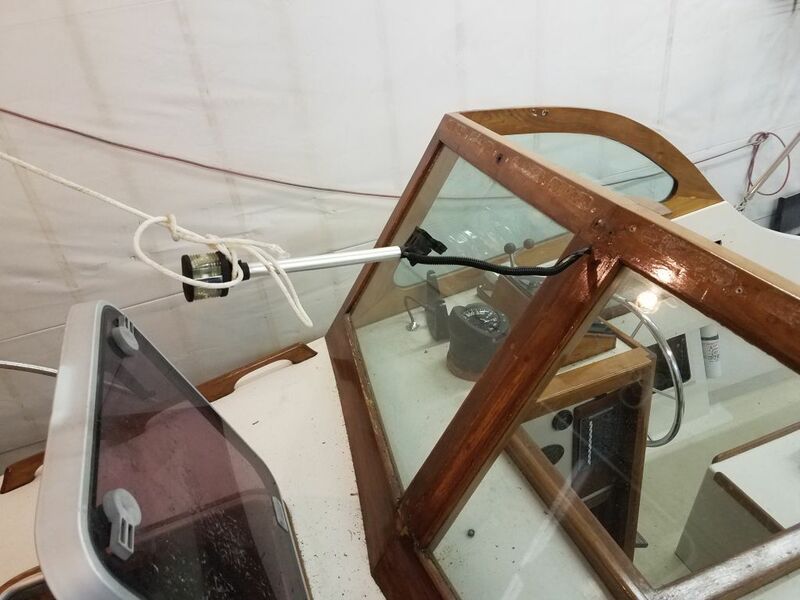 0600 Weather Observation: 38°, rain. 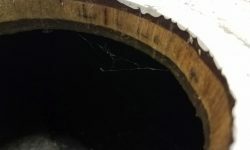 Forecast for the day: Rain and snow , then mainly cloudy.